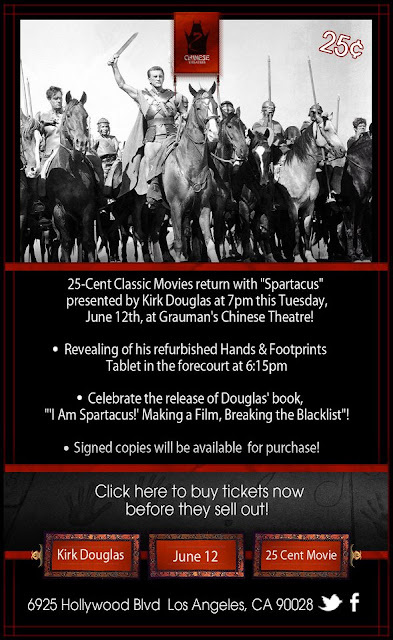 Tickets on sale now for 25-Cent Movie "Spartacus" presented by Kirk Douglas Tuesday, June 12th, at Grauman's Chinese Theatres! Join Kirk Douglas for the revealing of his refurbished Hands & Footprints Square at 6:15pm in the forecourt before the screening! We will be honoring him as a courageous actor both on and off screen in addition to celebrating the release of Douglas' book, "'I Am Spartacus!' Making a Film, Breaking the Blacklist"! Signed copies will be available for purchase!